There has never been anything quite like Leos Carax's Holy Motors. A strange mix of the surrealistic dread of David Lynch and the visual wild aesthetic of Baz Luhrmann, Holy Motors is an unabashedly original valentine to cinema itself. It's a rare feeling indeed to be in the presence of something that feels wholly unique, but in Carax's capable hands, even at the film's most bizarre, one never escapes the feeling that we are in the presence of greatness. It's a vibrant cinematic fantasia that eschews conventional plot structures, and follows a day in the life of Oscar (Dennis Lavant), who travels around town in a limousine with his trusty driver, Céline, on a series of mysterious appointments. At each stop, Oscar assumes a new identity, every one more bizarre than the one before it. Through elaborate costume and makeup changes, Oscar becomes everything from an old beggar woman, to a homeless hedonist who kidnaps a supermodel (played by Eva Mendes), to an average dad with a teenage daughter, to an assassin on his way to kill one of his own. 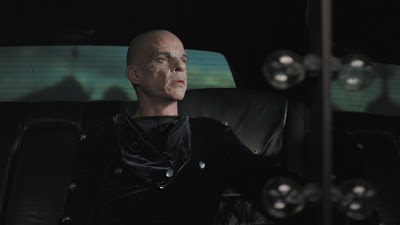 Denis Lavant as "Monsieur Oscar" in Leos Carax's HOLY MOTORS. Each persona consumes Oscar entirely as he transitions seamlessly between them. But who is he really? Does he even know? And does it even matter? Those coming to Holy Motors looking for a plot will be sorely disappointed, because that's not what this is all about. This is first and foremost a celebration of cinema, a phantasmagorical trip down a cinematic rabbit hole that can only come from a mind that has consumed decades worth of film and regurgitated them back into one exhilarating film. Cinephiles will have a blast dissecting its many elements and inspirations, from Jean Rollin to Godzilla to Georges Franju. And just when you think it can't get any stranger, the characters all burst out into an accordion cover of R.L. Burnside's "Let My Baby Ride" for the film's entr'acte, a relic of Hollywood's past, that returns here to thrilling life. Even the cast itself is a part of Carax's self proclaimed "love letter to cinema." The luminous Edith Scob pays homage to her iconic role from Franju's Eyes Without a Face, while pop star Kyle Minogue appears to belt out a wistful ballad over a Paris that seems to come straight out of the crumbling dreams of Alain Resnais or Vincente Minnelli. In fact, everything about the film seems to be crumbling, like it's a dying dream of films past. The surreal, dream-like quality of the film calls to mind the work of Luis Buñuel, creating a world where anything can and does happen. Edith Scob as Celine in Leos Carax's HOLY MOTORS. In the hands of a free spirit the cinema is a magnificent and dangerous weapon. It is the superlative medium through which to express the world of thought, feeling, and instinct. The creative handling of film images is such that, among all means of human _expression, its way of functioning is most reminiscent of the work of the mind during sleep. A film is like an involuntary imitation of a dream. That is precisely what Holy Motors is - an almost involuntary evocation of pure feeling and instinct, a delirious cinematic pastiche that is a celebration of everything cinema was, is, and will be. It is as if it was transcribed directly from a dream to celluloid - bold, fresh, thrilling, and new. There has been no more wholly original work in film this year than this. It is Carax's ode to the movies, to theatre, to acting, to music, to life itself. As these lost souls search for themselves, their pasts, and each other, Holy Motors becomes something much deeper than meets the eye - it's a cinematic Rorschach blot, with the ability to be almost anything to anybody. A valentine to the movies, a treatise on identity, a wild and weird trip celluloid acid trip, or perhaps all of the above. Ultimately what it is is up to the individual viewer, but regardless of what form it takes, it's nothing short of brilliant. HOLY MOTORS | Directed by Leos Carax | Stars Denis Lavant, Edith Scob, Eva Mendes, Kylie Minogue, Elise Lhomeau, Jeanne Disson, Michel Piccoli, Leos Carax | Not rated | In French w/English subtitles | Now playing in select cities.